In an exclusive discussion with Analytics Insight, Rajeev Baphna, Founder & CEO of Analyttica talks about how Analyttica enables businesses make fact-based decisions with a blend of art and science through their proprietary solutions, and train partners along those skills through their knowledge immersion platforms and/or build appropriate products/tools. Analytics Insight: With what mission, Analyttica was set up? In short, tell us about your journey since inception of the company? Rajeev: Analyttica was established with a mission to enable innovative analytical decisioning and learning, with solutions to create sustained business impact across the customer lifecycle. The Analyttica family comprises of professionals who are highly focused in the fields of information management and analytics across industries and functions. I have the vision to create a global platform in the data analytics “solutions” space and associated “knowledge immersion/training”. I am a firm believer of the fact that RoI on analytics efforts and spend can be increased “exponentially”, across large and small enterprises. To that extent, the analyst has to be immersed in the “contextuality” of the work across the industry (domain); the deep functional expertise in analytics across the continuum of statistics and machine learning/AI; and a good grasp on technology. A first in this regard, Analyttica has launched a patented simulation-based learning/training, and point-n-click data-mining solutions platform Analyttica TreasureHunt®, that has an uncanny ability to record every step taken by the analyst. This focus on capturing the approach versus only the output, translates the analyst’s mind into tangible records that are used to enable them and the organisation they are part of. Suddenly “knowledge attrition” is a thing of the past,… suddenly audits seem like a “breeze”,… suddenly one can grow one’s knowledge exponentially faster,… suddenly business impact starts coming to “life”! Analyttica, today, has global clientele, across USA, Asia, and Europe. With its Intellectual Property portfolio across global patents and more than 10 registered trademarks, multiple publications and papers, and significant interest from global companies, Analyttica looks to partner with them to enhance their value through its experienced professional team, and its solution frameworks. The 5-year journey has been enriched with learnings and experiences that have enabled Analyttica to scale up as well as create IP. Its greatest challenge is its greatest opportunity since it counts its main competitor as “Experience”. Ability to “Effectively” scale up will be a key driver for growth in the coming year. Analytics Insight: Brief us about your role and contributions towards Analyttica and the industry. Rajeev: We are in the middle of a data explosion that started decades ago with the advancement of technology, computing, storage, and communications. More data is being created in a year than in the entire previous history of human race. They say data is the new oil; the oil that promises progress, fortune, prosperity and development. But, what can one do with oil, if there is an inability to scale up powerful engines? The metaphorical engines in the context of this new oil, are perhaps the data analysts, business analysts, and data scientists, who play a pivotal role in helping businesses grow and optimize. Analysts lie at the confluence of three streams – data science skills, industry/domain understanding, and technology advancements – each of these are essential factors for an analyst to drive tangible and incremental business impact, using data-driven solutions, with an ability to create a simple bridge for the business manager from “data to impact”. A couple of decades ago, I was asked to build a world-class analytics organization for a global financial services firm. At that time, analytics wasn’t as widely recognized a field as today and was considered more of a support function with MIS creation. Working across geographies and over the years, I have been a fortunate witness to a fascinating, almost overwhelming, transformation of this strategic ability, perhaps a case pointing to the fact that analytics is not a “process or a tool”, but is, in fact, the core element of a “culture” in an organization. What has however remained fairly consistent, is the “inability or incapacity” of analysts to keep pace with the emergence of new data, continuously improving technology and techniques, automation and machine learning, and complex business problems. On the other hand, the impact of analytics on the bottom line has remained imperceptible even to some of the most successful organizations. Today, leaders across the world continue to concur with this observation. And, a large part of this issue arises from the fact that the bridge from “data to impact” is not effectively communicated or implemented by the analysts, primarily driven by a lack of “Business Contextuality”. This challenge existed decades ago, and still runs at large. Analyttica Datalab was set up in 2012 to take this challenge head-on, largely driven by “experience” rather than “technology” or “process/tools” alone. By definition, an analyst should be considered as an income-generating asset by an organization. An analyst should be able to generate tangible business impact and drive future strategy. When this mix of tangible and intangible outcomes are delivered, an analyst is said to have created “value” for the organization. Analytics Insight: So why do analysts still struggle to create value today? Rajeev: Value creation, in many respects, occurs through insight generation, through an ability to connect the dots using data points to interpolate, and extrapolate, and use substantial “art” in addition to “science”. The existing approach to learning in this field, which is primarily focused on instruction-based learning a new coding language and/or mastering tools and techniques, rarely allows for those qualities to foster, and nourish, leading to micro-retention of knowledge over time, and severe distortion of business elasticities viewed from an analyst’s versus a manager’s perspective. For example, to connect the dots, one needs to be aware of the universe and the constraints they are operating in, as to exactly what the “dots” are, before proceeding on how to optimize “connections”. An emphasis on “application and business context”, crucial to connecting the dots, is perhaps missing to a large extent and is left to “on-the-job experiences” over the years. Compounding this challenge, is the fact that the world of data and technology has been rapidly evolving. Because of the dynamic nature of the industry, even highly competent analysts struggle to keep pace with moving market conditions, business context, and rapid evolution of new-age tools and techniques. Businesses are experiencing many models that fail in short times, sluggish innovation in the usage of data, and limited upside for investing in trained analysts; not to mention the huge impact of “knowledge attrition” when talent moves/attrites. This knowledge attrition is not so much as a lack of knowledge management tools, as is the know-how associated with an analytical thought-process and approach, with the departure of talent. An ideal scenario to address the above would have been direct leverage of analytics talent for businesses to experience value from the practice and its ability to significantly impact the business metrics. A synergistic confluence can be created between aspiring/existing analysts and the businesses as the consumer of their intellectual prowess and data-led predictability patterns. Analysts are inherent problem solvers, and they thrive on solving challenges that lead to asymptotic convergence of solutions, through iterative approaches of scientific decisioning. This coupled with a high degree of “Contextuality” can be created via a heuristic platform to all self-motivated learners, students and professionals alike, to learn and solve real business problems using traditional as well as new-age analytical techniques, and generate incremental value to businesses, thereby making them data savvy and insight hungry. The age-old game of“treasure hunt” via riddles/puzzles that ultimately lead to a “treasure”, is a testimony to this fact, and can be simulated in a unique way in the field of “Contextual Analytics”. If successful, this can provide a high degree of “experiential learning”. Herein lies the genesis of Analyttica TreasureHunt® (ATH). 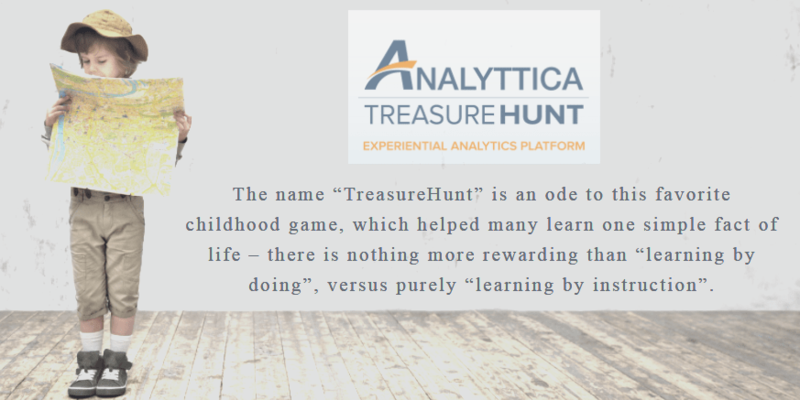 The name “TreasureHunt” is an ode to this favorite childhood game, which helped many learn one simple fact of life – there is nothing more rewarding than “learning by doing”, versus purely “learning by instruction”. Embarking on a highly challenging but fulfilling journey, and immersing itself into full-time technology-enabled platform development, encompassing people, expertise, experience, success and failure, Analyttica is proud to introduce an “experience” that can transform the ability of analysts to evolve themselves into impact-generating levers for the businesses; and businesses in-turn can view analytics as the indispensable inputs to critical decisions. Analyttica believes that this is the most advanced heuristic platform, fueled by powerful machine learning algorithms and AI, that helps one become an “exponentially better analyst”, faster. Organizations will benefit hugely in terms of knowledge immersion and retention by permanently capturing the “thought processes” of analysts via their “approaches”, as much as their “analytical outputs”. This is a tremendous help in ensuring successful audits and compliance as well for all organizations. Rajeev: With the advent of technology, the world of data has exploded and is changing at an exponential rate. There is a huge demand for Data Scientists and Business Analysts, who can manage data, connect the dots to convert data into actionable insights, and script business stories that help managers bridge the gap from data-to-impact. Glassdoor’s report of 50 Best jobs in America in 2017 states a Data Scientist’s role with a job score of 4.8 out of 5, a job satisfaction score of 4.4 out of 5 get a median annual base salary of $110,000. The Data Scientist roles came in first for the second year in a row; IBM predicts demand for Data Scientists will soar 28% by 2020. Because of the dynamic nature of the industry, even highly competent analysts struggle to keep pace with moving market conditions, business context, and rapid evolution of new-age tools and techniques. The traditional/existing approach to learning in this field, primarily focused on instruction-based learning a new coding language and/or mastering tools and techniques, falls short in terms of deep understanding of the hard skills and application of these skills to generate business insights, leading to micro-retention of knowledge over time, and severe distortion of business elasticities viewed from an analyst’s versus manager’s perspectives. 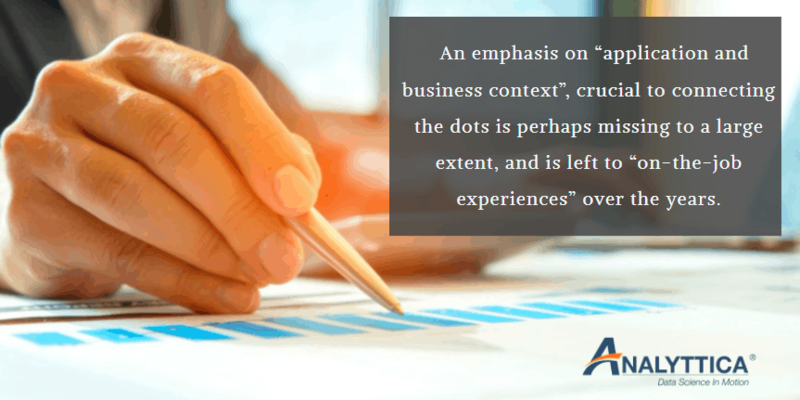 An emphasis on “application and business context”, crucial to connecting the dots, is perhaps missing to a large extent and is left to “on-the-job experiences” over the years. Analytics is “Contextual”, a true blend of “Art and Science”. It certainly is not a tool or a process, and businesses are experiencing many models that fail in short times, sluggish innovation in the usage of data, and limited upside for investing in trained analysts; not to mention the huge impact of “knowledge attrition” when talent moves/attrites. This knowledge attrition is not so much as a lack of knowledge management tools, as is the know-how associated with an analytical thought-process and approach, with the departure of talent. Analyttica TreasureHunt® (ATH) is a highly intelligent and interactive, patent-pending, cloud-based platform built by experienced global industry professionals to enable significantly ‘reduced time to learn’ with a high retention of practical knowledge. The solution is an absolute first – ‘Advanced Data-Analytics Platform with Powerful Experiential Learning’. ATH learns how one learns, makes one’s learning curve steeper, and makes concept retention and recall simple, all the while ensuring that one operates in a simulated business environment with real data. ATH focuses on three key elements – Learn by Doing, Apply via Experience, and Solve Real Problems immediately. ATH has the potential to transform the landscape of data science learning and application in a business context. It helps manifest an analytical thought process into actionable steps, and “records” that “approach” as well as the “output”, for every analysis, which can be used and reviewed any time in the future, by others. In the words, Analyttica is proud to introduce an “experience” that can transform the ability of analysts to evolve themselves into impact-generating levers for the businesses; and businesses in-turn can view analytics as the indispensable inputs to critical decisions. I believe that ATH competes only with “experience”. ATH is the most advanced heuristic platform, fueled by powerful machine learning algorithms and AI, that helps one become an “exponentially better analyst”, faster. Organizations will benefit hugely in terms of knowledge immersion and retention by permanently capturing the “thought processes” of analysts via their “approaches”, as much as their “analytical outputs”. So, experience a point-&-click journey with Learn.Apply.Solve at ath.analyttica.com. • Analyttica was listed in InTech50 2015: Innovative companies that made the cut. • Featured as 50 Cool Startups of the Year 2014 on Silicon India.